Get that wheelbarrow off the garage floor and on to the wall! Admit it, wheelbarrows take up a lot of space in whatever room we put them in. But since it’s something that we need, we “tolerate” its presence. I hurt my shin every time someone forgets to put the wheelbarrow back to its proper place. I’ve complained a lot about it to my husband – begged him to do something about it. When he finally got tired of my nagging, he went to work. Simple and easy to make, there’s no excuse not to make one. 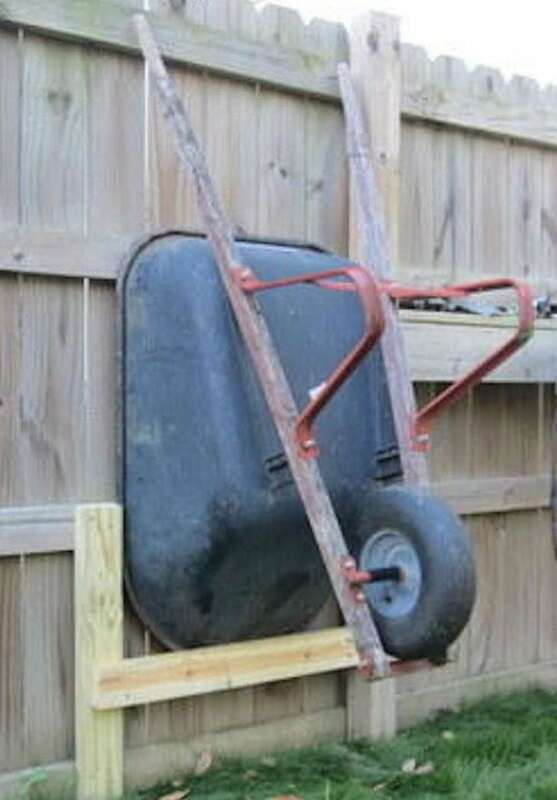 He made a wheelbarrow rack, a DIY project he found over the Internet. He started working on it on a weekend and finished on the same day. Our wheelbarrow is now off the floor. He said the work is so simple and easy. I believe him – he did racks for my parents and his! Are you ready to get that wheelbarrow off your garage floor and on to the wall?